INCLUDES ALL FIVE fun & intriguing whodunnits and ALL FIVE delicious dessert recipes from the popular culinary cozy mystery series PLUS a FREE BONUS Prequel to the series! All in one BIG BUNDLE! 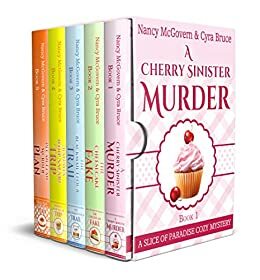 For MORE THAN 1,000 pages (KU) you'll be digging into suspicious secrets & tasty desserts alongside Paradise Point, Florida's favorite amateur sleuth, Faith Franklin! Investigating murder scenes never tasted so sweet! AND a FREE Prequel to the series that has never been available on Amazon before! So, when her grandmother calls and asks her to move to Florida to help run her café, she cannot get out of Minnesota fast enough! And before she knows it she is standing in Paradise Point, the beautiful, oceanside plaza in which Bessie's Café is located, hardly able to believe her good fortune. Life is now exactly how Faith had imagined it could be. She's made wonderful friends. The café, now renamed the Slice of Paradise, has been renovated to showcase her amazing desserts. And both locals & tourists are loving it! The owner of a nearby cupcake shop is not at all happy with Faith's arrival in Paradise Point. She has accused Faith of trying to ruin her by stealing her recipes & designs. And she is not shy about letting everyone know it. Learn the answers to these questions and so many more inside this big, bundled box set! We'll see you in there! 5.0 out of 5 starsA Slice of Paradise describes this series perfectly!! Faith Franklin owns Slice of Paradise. She is also acting as the manager of the apartment complex where she lives. The owner (and regular manager), Mr. Edwards, along with his daughter Laura, and his nephew Nathan are taking a ski vacation in Utah. The apartment building has two new residents, Ana (Tatiana) Monk and her sister Tish (Leticia). Tish suffers from severe allergies and Ana does what she can to care for her. As Faith makes every effort to make them more comfortable, she gains new friends. The previous tenant, Dean Lomas, who was evicted from the apartment complex was not happy. Mr. Edwards reminded Faith to call the police if he shows up and tries to start trouble. Faith decides to hold a fund raising event at Slice of Paradise, to help raise money for Tish's treatments. At the event, Faith meets Sal, Ana and Tish’s only brother. During the event, Dean shows up and tries to start an argument. Sal steps in and escorts Dean out the door. When a pipe out front bursts, Sal goes out to help Faith try to stem the flow of water. While holding the pipe, Sal is killed. The Deputy Sheriff, Tyler Valdez focuses on Faith because it happened right out front of her store. Was Sal really the target or was he just between Faith and the murderer? Who would want to kill such a likeable guy? What is wrong with Tish? Is there a cure for her illness? What can Faith do to help the Deputy Sheriff find the murderer? Will she get any answers? Since she was a very little girl, Faith Franklin has dreamed of having her own café. She loves to bake and has even developed her own gluten free and vegan recipes for pastries. After a call from her Grandma Bessie asking her to come to Florida to take over Bessie’s Café, Faith packs all of her belongings and moves from Minnesota to Florida. Faith has never managed a café before, but that doesn’t stop her. Together with Laura Edwards, Grandma Bessie’s helper in the café, they update and remodel the café. They turn it into the “Slice of Paradise” tea room, selling gluten-free pastries in addition to the standard fare. After Faith enters a Cupcake Baking Competition, and one of the competitors is found dead, Faith becomes the main focus of the Deputy Sheriff’s investigation. Why is the Deputy Sheriff focusing on Faith? How was the baker killed? Who else may have wanted the baker dead? Will the Deputy be able to find the real killer before someone else is harmed? Will the tea room ever open? Will Grandma Bessie approve all the changes? Who will pay for all the changes? All the work Faith Franklin and Laura Edwards have put into Slice of Paradise is paying off. The place has a steady flow of customers and business is looking up. They have also been asked by Krystle, the local newspaper editor, to cater the annual party for the newspaper's contributors. Unfortunately, many of the contributors do not get along very well with each other. Krystle Hatton tries to keep everything running smoothly, but it is a monumental task. During the party, one of the guests, Becky Harris, falls overboard and drowns. Deputy Sheriff Valdez rules it an accidental death. Dr. Asante, Becky's boyfriend, is certain that Becky was murdered. Following the boat party, Faith and Laura get another catering contract. When Dr. Asante turns up dead, Deputy Valdez rules it a suicide and closes the case. Was Becky's death an accident or murder? Did Dr. Asante actually commit suicide or was he murdered? Are the two deaths connected? If so, who killed them? Can Faith convince Deputy Valdez that a crime has actually been committed? Faith, Laura and Grandma Bessie made it to the Final Round in the Cynthia Rochford Cupcake Marathon. In the semi-finals, they were pitted against Nico Morris, last year's champion, who seemed to have a huge following. Nevertheless, they managed to defeat Nico and make it to the final round. They have their work cut out for them, as they will be competing against Wilhelmina Roby, who has won the marathon numerous times. When Wilhelmina turns up dead, Nico is selected as the replacement in the finals, rather than The Baking Babes, who had competed against Wilhelmina in the semi-final round. Naturally, Deputy Sheriff Valdez thinks Faith had the best motive, winning the contest with a Grand Prize of $50,000. But the other semi-finalists had an equally valid motive - Make it to the Finals with a chance to win the Prize Money. After a second murder, the tension mounts. Who killed Wilhelmina? Why was she killed? Are the two murders related? Will the contest be cancelled? Will Faith be able to solve the mystery? Faith and her friends from Slice of Paradise have joined several other couples on a Safari trip in Kenya. Faith, Laura, Grandma Bessie and their friends are really looking forward to exploring the area and seeing all of the different animals. Unfortunately, Roy Daish, another member of the safari party, is a chronic complainer and seems determined to ruin everybody's vacation. Roy's wife, Jasmine, tries to appease him, but his complaining continues unabated. At the first stop on the safari, the Elephant Orphanage, their driver, Solomon, is found dead. Only two members of the safari, Richard Lovett and the tour guide, Mary Mbiti, knew Solomon from previous safaris. Therefore, the prevailing theory is that Solomon was killed by one of the workers at the Elephant Orphanage. Even after Solomon's murder, Roy continues to carry on with his persistent complaining. Mary tries her best to keep the peace and help everybody to enjoy the safari. When Roy is found dead, the tension escalates. Are the two deaths related? Who killed Solomon and why? Why was Roy being so disruptive and why was he killed? Can Faith and Laura uncover the killer before more people die? Nathan is getting ready to showcase his dream creation, a botanical garden tourist attraction and Faith is preparing to open a second restaurant, Eat With Faith. Today, Nathan is giving Laura's troubled teens a "soft opening" preview of the park. When they reach Nathan's pride and joy, the Secret Garden, the joy turns to horror when they discover that Robert "Robbie" Lewis, Jr. has been killed. Robbie is the son of a state senator and one of Nathan's best friends. Unfortunately, Detective Tyler Lynch jumps to the conclusion that the murder must have been committed by either one of the teens who had a troubled history or by Nathan. His logic is that the police always look at family and friends as primary suspects. Who killed Robbie? Why was he killed? Will Nathan and Faith be able to save their garden paradise? Will the pools area open as a tribute to Robbie, as Nathan plans? This book starts much slower than the previous books in the series, but still has plenty of twists and surprises. The story is wonderful with lots of different personalities and locations. There are times when the multitude of details slow the story a bit. As always, the Slice of Paradise books provide enjoyable reading material with loads of information that you may not find elsewhere. These stories are well written with lots of distractions that make it appear more like real life. The primary and some of the secondary characters are well fleshed-out with interesting personalities, making the stories even more interesting. The author makes you want to find the Slice of Paradise for some tea and pastries. The biggest issue with series such as “A Slice of Paradise” is that it takes longer to write the books than it does to read them. Fortunately, Nancy McGovern does a great job of keeping the time between stories to a minimum. 5.0 out of 5 starsAnother great series by this author! 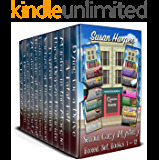 I love this author's cozy mysteries. They move right along, plenty of action, nice clean fun and adventure. The food sounds tasty, great descriptions of people and places. Can't wait for the next series. 5.0 out of 5 starsA great cozy box set plus recipes! 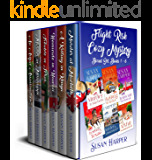 I have read everyone of these stories and they are great cozy mysteries. 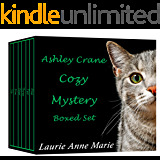 If you enjoy good clean mysteries this box set it for you. You will enjoy the characters, the story lines and the recipes.